Making sense of all that complicated photo jargon, Part 2! Last month I went over the first part of the exposure triangle, the shutter speed. I explained that it could reveal, at very short and very long exposures, many things our eyes could not see. If the shutter speed at it’s best, reveals much, I often use the camera’s aperture (or f-stop) to hide or obscure what is around my subject. But first, lets talk about what your camera’s aperture is and how it works. Well, it’s a total rip-off of your eyes’ iris! You know, the little black holes in the center of the eyes that gets so huge when your hippie friends used to smoke…or, how about when your eye doctor puts the drops in your eyes to dilate them? Remember how sensitive your eyes became to light? That’s because he took your eyes off Auto and put them into the Manual, wide-open, mode. Thank God for THAT Auto mode! When working properly the iris in our eyes are constantly and smoothly, closing or opening, adjusting to lighting levels around us without us so much as breaking a sweat. OK, maybe some of us need to break-out the sunglasses sometimes—kinda like putting a neutral density filter (to cut down the light) on your camera’s lens. See we have more in common with our cameras than you thought! Your camera’s aperture, like the iris in your eyes, is another way to control the amount of light that reaches the film or the camera’s sensor. The smaller the aperture’s opening the less light will pass through your camera’s shutter and onto the sensor or film. And, the larger the opening…..you probably guessed that one, right? Just to make something so simple complicated, some engineer decided to call these apertures: f-stops (don’t ask) and attached numbers to them! But, not content with the fractions being used for the shutter speeds they decided to use decimals for the f-stops! That’s how we ended up with the most confusing and hardest part of the exposure triangle to teach. So, here are the standard f-stops starting with the LARGEST opening and going down, smaller with each step (even thought the numbers are getting bigger), allowing half as much light in with each step. The lens widest aperture in this example is f 2.8, followed by f 4.0, f 5.6, f 8.0, f 11, f 16, and f 22. If your lens is at f 2.8, the aperture is wide open allowing the most light possible through to the shutter. As we adjust the lens to the higher numbers the aperture gets smaller allowing less light to the shutter. Got that? Well, you don’t have to like it, but if you can just understand how to control this part of the exposure triangle, you can create images that the human eye could never see. For example, one of the side effects, created by a large aperture, like the aforementioned f 2.8, is my favorite effect when doing portraits of people outside. It’s called shallow depth-of-field in my world. Depth-of-field in an image is simply how much is apparently in focus in front of and behind the subject you focused on. So, what’s so hot about that you say? With depth-of-field control I can direct you to where I want you to look first in a photograph by controlling what’s in focus and what’s out-of-focus. Here’s how it works. 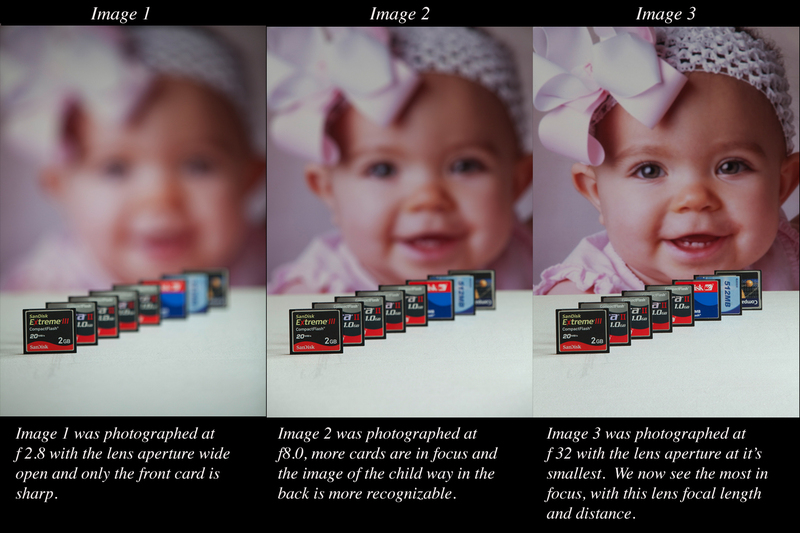 When the aperture is at f 2.8 you get the least amount in focus in an image (often only inches). When the aperture is at the higher numbers, like f 22, you get the most that the lens can produce in focus—like hundreds of feet to infinity! The bottom line is what do YOU, as a photographer, want to show the viewer? Often showing our audience everything in focus shows too much—that’s what our eyes do—you can reveal more often by showing less. It really depends on what the subject is. Is it the Grand Canyon or the lizard on a rock, on the rim, of the Grand Canyon? You can decide this when you control the depth-of-field. The f-stop is the only thing in the exposure triangle that controls depth-of-field. For you visual types (you wouldn’t be reading this if you weren’t), here are three images I set-up to illustrate depth-of-field at different apertures. Next month I will wrap-it-up with the third part of the exposure triangle: the ISO or film speed and how the three parts work together. If you missed Part 1 you can view it on the Informer’s website or on our blog.